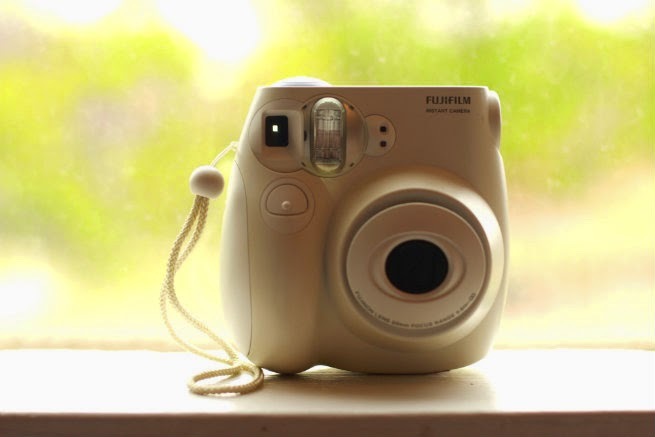 One of my favorite things that I discovered and purchased while living abroad in Korea was a Fujifilm Polaroid camera. I absolutely love that little camera. I take it with me on special occasions as well as on special trips. Sure, it is a bit bulky and adds to my luggage but it's worth it. When Dave and I went to Hawaii this past March I took it with us and got some fun little pictures to remember our trip with. My favorite polaroid pictures were from my beach wedding. The total number of guests at my wedding came up to a total of 24 people - family and my closest friends. My friend Alisha went around and took polaroid pictures of everyone. That picture was then placed in a scrapbook where they wrote a message next to it. They could write a word of encouragement, a verse or whatever they wanted. I love that it was so personal and that their picture is right there. I also really cherish having wisdom on marriage from my parents, siblings and friends. Godly wisdom from those closest to you is just something special that I can't really put into words. I've also used the camera at special occasions for other people. My friend here in Woodward opened a crossfit gym and I took some pictures with the Polaroid and gave it to her. When I visited my friend in California and met her baby, more polaroids! These little pictures are great for memories, showers, guestbooks and more. 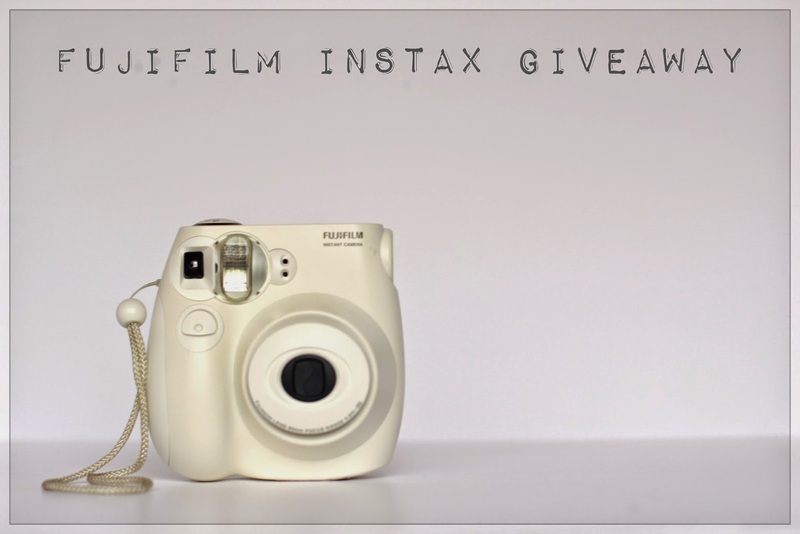 Today I'm teaming up with Felecia, Rachel and Alex to give away a Fujifilim Instax Mini Camera + 1 pack of film (10 pictures) to one lucky winner. The pictures are pretty equivalent to the size of a credit card and are just so much fun. I've been wanting to give away this camera on my blog for a while now and I'm excited one of you readers will get it. The giveaway is open internationally as long as the international winner agrees to pay for shipping. The winner will be verified, etc. etc. Good luck! I saw a fun idea with street photography... give the person an Instax photo of themselves as a thank you for allowing you to take their photos! Such a great idea! that's what I'd do if I won this!! P.S. I just realized after I followed S2SI on twitter that I was signed in with my personal account. So I followed the other two with my blog account. Not sure if it makes a difference, but thought I'd let you know. This camera is so cute! I want one! :) I am really trying to improve my photography skills, and I think this camera would help me be more creative. ahhh this is so neat! i LOVE polaroids & little tiny ones? so perfect for tons of projects! i would definitely love to take this when i travel for some instant pics! so fun! I would take pictures of my kiddos! i would take pictures of my baby and anything that caught my eye(in a good way). This is such a FUN giveaway! I loved taking pictures before, but now that I have Lincoln I want to take pictures ALL THE TIME! I don't want to miss anything! I've always wanted a cute Polaroid! It would be perfect to capture college memories and help me decorate my apartment next fall! All the fun times! Or of the beautiful Texas countryside. I experimented with my friend's polaroid camera and loved it! I would take funny pictures with my and my cat doing the ridiculous things that we do, and then post them around the house to give my husband a good laugh. Pictures of my bulldog of course! Omgosh! I love these cameras! A friend of ours had one and snapped a couple of pictures! I think my favorite thing would be to take pictures when Tyler and I go to art galleries! That is a good idea and a thoughtful one. You are creative and I'm sure you'd come up with all kinds of fun ideas. aw! I bet your bull terrier would be cute in polaroids. What is a lomo? This is perfect for trips. I also think this would be fun for your passport date nights! That would be a good way to use polaroids! Babies and pictures just go together! Having instant pictures of Lincoln to put around your house would be so fun! Geocaching - I just looked that up on google =) That sounds fun and a polaroid would be neat with that. The countryside would be beautiful! I gotta ask E or W Texas? I'm in W Texas sometimes and it's a bit dry and flat. Still pretty just different than Eastern TX. Aw! That would be so fun! That would be a really neat way to use the polaroid camera. oooh! art galleries would be a fun place to use it! I want it! You know I'd love to annoy Jordan with one of those. Booya! hi! lomo are analog cameras, I've got 2 of them, a diana f+ and a sprocket rocket! they are much fun ^^ there's a whole community of fans at lomography.com you should check! What a neat little camera! We're hosting a party in a few weeks with a backdrop for pictures, this would be so handy! It would be right up your alley, I'm sure! I'd take amazing pictures this summer at the beach & of course shots of my pets..always. ha ha! Jordan would really dislike me then! That's funny. That sure would be fun for hiking! That would be perfect for a party!! You are full of fun ideas, friend! mmm, coffee! Why squirrels? I'm curious. beach + pets = awesome! I would take pictures of my family and of me and my boyfriend for our new apartment! Such a cute little camera. I can just imagine all the special moments I could capture with one, all with that lovely vintage polaroid feel. I have some cute baby bear cubs that have taken to coming out and playing in my yard, so I think they would be fun to take pictures of this spring ! I would take fun headshot photos of my family to hang! Hahahahahahah!!!! I laughed so hard at this comment! I SWEAR I am 100% woman. I guess I need to clarify this. I'm still laughing! I'd take pictures with my friends to hang in my apartment! Thanks for the giveaway! I would take pictures with my friends from college the next time we get together! Thanks for the giveaway! That would be fun to take pictures back home with family! When do you leave for to go back home? Is it Sweden? Funny family moments are the best! Gena, that would be super fun to take pictures of kids with this. They'd love it too! um, baby cubs? That is AMAZING! more cute than normal ;) I like that! This is awesome!! I actually print pictures for my planner every week and this is something I would really love!!! I would take fun pictures of my kids on a daily basis. We have a total of 8 kids and 3 grand-babies, so there is NEVER a dull moment and plenty of picture worthy moments!! I bet there never is a dull moment! That would be fun to capture them with the polaroid. How fun! I'm sure you'll have a great trip. I'm glad you are laughing! After I wrote that I thought 'oh man, (no pun intended) I really might have just freaked out someone).